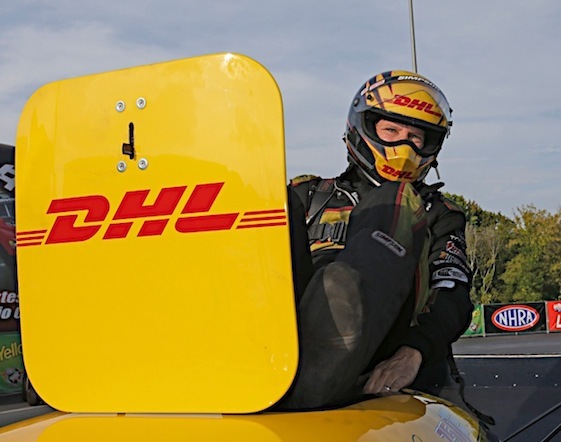 Worsham claimed his first Funny Car pole of the Mello Yello Drag Racing Series season via a Texas Motorplex track record, 1,000-foot run in 3.917-seconds at 323.58 mph. In addition, the Southern California native earned bonus points for finishing in the top three in all four qualifying sessions to bump his lead over Jack Beckman to 18 markers heading into race morning of Round 4 of the six-race Countdown to the Championship. Indeed, Worsham now has qualified in the top two during three of the last four events in a season that has seen arch-rival Beckman and crew chief Jimmy Prock of Don Schumacher Racing re-set the national elapsed time record on three occasions. strategy,” said Worsham, who is teamed with crew chiefs Nick Boninfante and Jon Oberhofer. “Whatever’s put in front of us, you have to win. Drag racing’s a pretty basic sport _ you’ve got to get to the finish line first without red-lighting (fouling). Worsham will begin race day against No. 16 qualifier John Hale of Addison in Funny Car pioneer Jim Dunn’s “One Bad Texan” Dodge Charger. ESPN2 will televise one hour of qualifying coverage Sunday at 3 p.m. (CDT). The network also will air three hours of finals coverage Sunday starting at 7 p.m. (CDT). “We’re all making the best runs we think we can,” said Worsham, 45. “All we can do is get as many points a week as we can. You have to earn every point that’s yours and hopefully when it’s all said and done and we leave Las Vegas and head to Pomona, we’ll be in a position to race for the NHRA Mello Yello Funny Car championship. That’s really my goal.” Round 5 of the Countdown will be contested at The Strip at Las Vegas Motor Speedway Oct. 29-Nov. 1. The season-ender will be staged at Pomona (Calif.) Raceway Nov. 12-15. Worsham posted his final win in the family-run Funny Car owned by his father, Chuck, in 2008. Del’s subsequent move into Top Fuel was capped by his world title with Al-Anabi Racing and master tuner Alan Johnson in 2011. Worsham and Johnson collaborated for eight victories and three runnerup finishes that season. Worsham then shocked the sport shortly after the season ended by announcing his retirement. Worsham opted to spend the 2012 season as crew chief for rising star Alexis DeJoria, his current Kalitta Funny Car teammate from Austin and driver of the hot pink Patron XO Café Incendio Toyota. 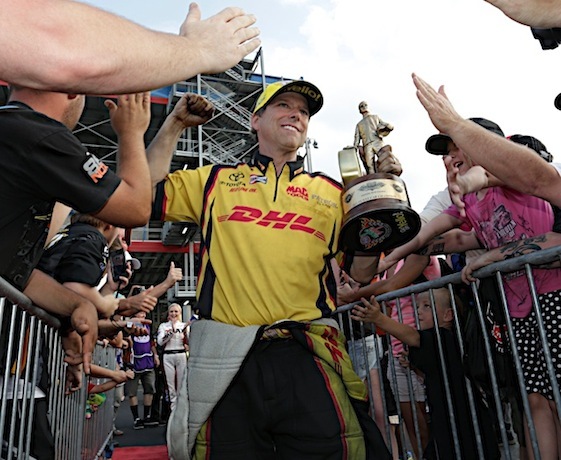 Worsham said there are no similarities to his Top Fuel title run and his current place atop the Funny Car point table. “It’s been different because in Top Fuel we were way out in front and they took all our points from us (reset for the Countdown) and we steadily declined to the point where I lost on a record run in Reading (Pa.),” Worsham said. “I was really probably at my lowest point of the whole season at this time of the year in 2011.” Worsham rebounded to win the title by 58 points, or three rounds of racing, over Spencer Massey of Fort Worth. Worsham credited “Fast Jack” and Prock for forcing his team to ramp-up its performance after the NHRA’s annual summertime three-race Western Swing. “It’s a bunch of things,” Worsham said. “Without going into great detail because we didn’t come up with all the ideas _ but we did rip a few of them off _ when Jack Beckman left Sonoma he was making those incredible runs and we all knew that we might have a problem,” Worsham said. “We thought, ‘Well it’s sea-level at Sonoma (Calif.), we’ll see what happens in Seattle (Kent, Wash). We go to Seattle and ran great there and probably should have won _ driver let ‘em down. We go to Brainerd (Minn.) and absolutely got our butts kicked. At that point we knew something has to be done here. Worsham’s resume also includes victories at The Plex in 2002 and 2004, a season in which when he won a career-best 41 rounds. When reminded that he is on-pace to join Kenny Bernstein and Gary Scelzi as the only drivers to win NHRA championships in Top Fuel and Funny Car, Worsham uncharacteristically suggested it’s time to slow down.